On the occasion of the International Day of Peasant’s Struggle, this 17th of April, a large coalition for peasants’ rights appeals for people’s support as negotiations for the UN Declaration on the Rights of Peasants and Other People Working in Rural Areas draw near. Although peasants’ systems feed the vast majority of the world’s population, the current industrial food system is undermining small-scale producers. With dominant policies enabling aggressive land and resource grabbing and human rights defenders systematically criminalized, a mechanism that can fully recognize and protect the human rights of the rural world is urgently needed. To this end, the peasant movement set out more than 15 years ago to establish an international declaration on the rights of peasants. Now, after considerable advocacy work and mobilization, and with UN negotiations around the corner, people’s backing appears more important than ever. 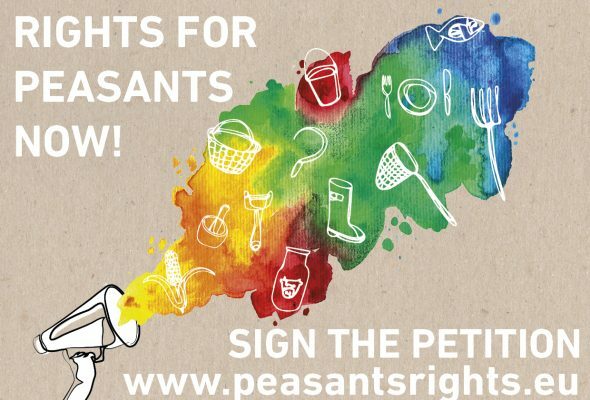 Following the International Congress on Peasants’ Rights last March in Germany, a coalition of social movements and civil society organizations launched a petition to increase pressure on the EU and its Member States to actively participate in good faith in the elaboration of a declaration. As opposition and neglect have been hallmarks of their stance, the petition requests people to demand their respective Ministries of Foreign Affairs to recognize and engage in favor of peasants’ rights, including their rights to land, seeds, biodiversity, decent income and livelihood and the means of production. With more than 3000 signatures collected over two weeks, the petition targets the backing of 30.000 people, particularly from across Europe. Violations of the rights of peasants and other people working in rural areas also take place in Europe, where the Common Agricultural Policy (CAP) is supporting the logic of “increase in size or disappear”. This production and export-oriented European industrial agriculture and food system leads to loss of jobs, bad living conditions for farmers and agricultural workers, and rural abandonment. The enormous external impacts on the entire planet of this agricultural model go without mentioning. The fourth session of the Open-Ended Intergovernmental Working Group (OEIWG) on a UN Declaration on the Rights of Peasants and Other People Working in Rural Areas will take place from 15-19 May in Geneva. The position of the EU block will be under the spotlight, on account of it previously questioning the legitimacy of peasants as right holders and its reticence to consider matters such as land, seeds and biodiversity as rights needing new standards. By supporting their struggle, peasants and other people living in rural areas will maintain agroecological, resilient alternatives to industrial agriculture and will keep developing healthy and sustainable local food systems for the future of our planet. – The International Day of Peasants’ and Farmers’ Struggles celebrates its 21th anniversary today. In 1996, La Via Campesina (LVC) declared April 17th the International Day of Peasants’ and Farmers’ Struggle, after nineteen peasants – both male and female members of the Landless Movement – were assassinated while they were taking part in a legitimate struggle to obtain land in southern Pará, Brazil. This is called the Eldorado dos Carajás massacre. – The OEIWG was created in September 2012 by Resolution 21/19, as a result of advocacy work by La Via Campesina and a long list of supporting organizations throughout more than 15 years.